Each month Farmer Amy opens up the farm to visitors for Farm Day, welcoming area farmers and vendors to promote their wares, and open to the public to visit. With factory farmed food becoming more and more pervasive, and food raised in unsavory conditions, these events are so important to connect the ‘farm to your fork’, and know how your food is raised! On the menu for this cooking demo, I chose lamb pasture raised on Thames Farm, a protein many are not all that familiar with in the USA and one of my favorite! This grass fed lamb is a protein powerhouse, high in healthy omega-3 fatty acids, and rich in vital nutrients such as vitamin B12, B6, niacin, zinc and iron. Produce for the demo was kindly supplied by Lisa of Farm Fresh Carolinas, an ALL organic produce delivery service based in Fort Mill, SC. It is a real treat to find a delivery service that delivers only organic produce to your door, fresher and cheaper than you can find it in the store! Farm Fresh Carolinas have supplied the discount code GREEN for you to receive $10.00 off your first order! 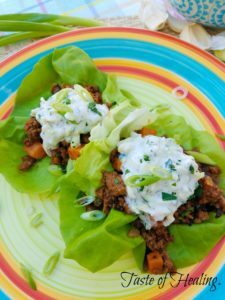 The complex layers of flavor from the Baharat seasoning pair perfectly with the ground lamb, served on lettuce cups and topped with cooling Zucchini Tzatziki this makes a perfect spring entertaining dish. Whisk together the spice ingredients and store in an airtight container, this recipe makes extra. Heat a medium saute pan over medium high heat, and brown the lamb well, breaking up any lumps. Line a medium bowl with double layer of paper towel, and drain the lamb. Add the onion, garlic and ginger to the pan, and saute until just softened. Add the lamb back to the pan, add the spices and saute just a minute. Add the broth, tomato paste, salt and balsamic vinegar. Turn down the heat and allow to simmer for 20 minutes. Add the sweet potato, and cook until just softened. The consistency of the final dish should not be too sloppy, simmer a little longer if needed or add extra liquid if too dry. Add the kale, adjust seasoning. Prepare the lettuce, carefully break off each leaf, wash well and dry. To serve, place a scoop of lamb in the lettuce cup, and top with the Tzatziki sauce. This dish can also be served family style. The recipe for the Baharat seasoning will make extra, this is a great seasoning to have on hand to liven up a variey of dishes such as roast chicken or soups.